Right. 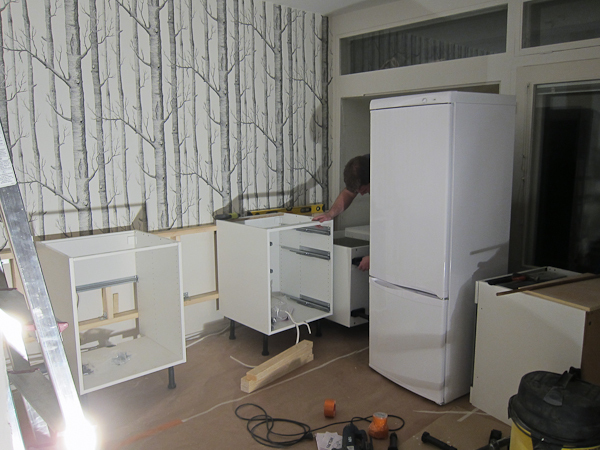 So, after we had the old kitchen taken down and finished the new walls we could start assembling the new kitchen! 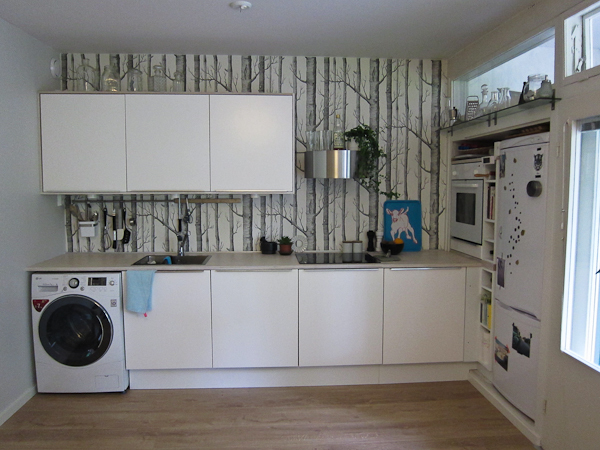 I bought the cabinets and doors from Ikea – I’ve been happy with my previous Ikea-kitchens, they look nice and are very good value for money. 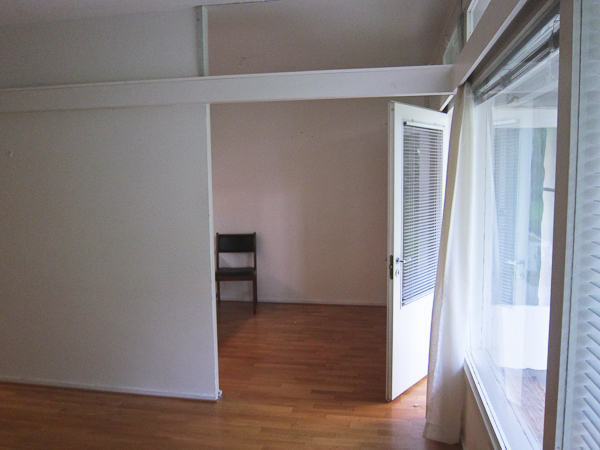 That nook that extends from the wall outwards was a challenge: it’s only 172 cm high. 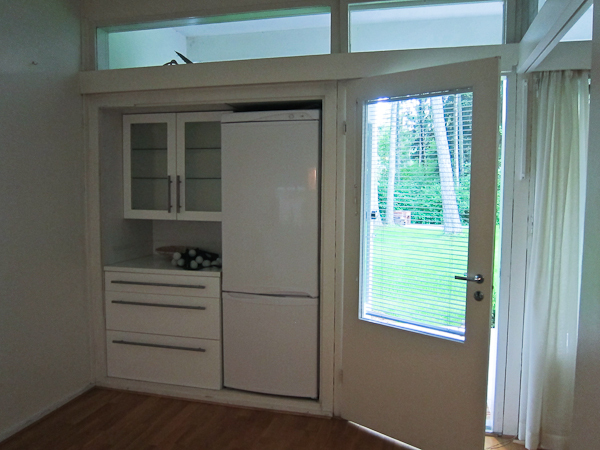 It had the fridge-freezer combi and that fit nicely, so I decided to stick with that. 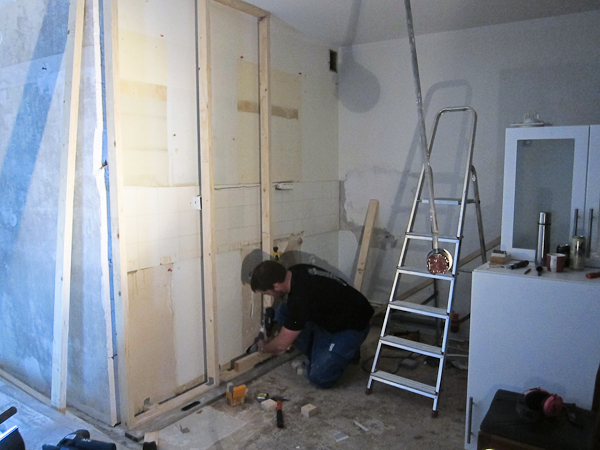 Another challenging point was that the lower cabinets needed to be extended from the wall about 8 cm in order to fit the plumbing there: my counter needed to be at least 70 cm deep. The normal depth is 62 cm, but a lot of places sell 80 cm deep counters for islands and such. 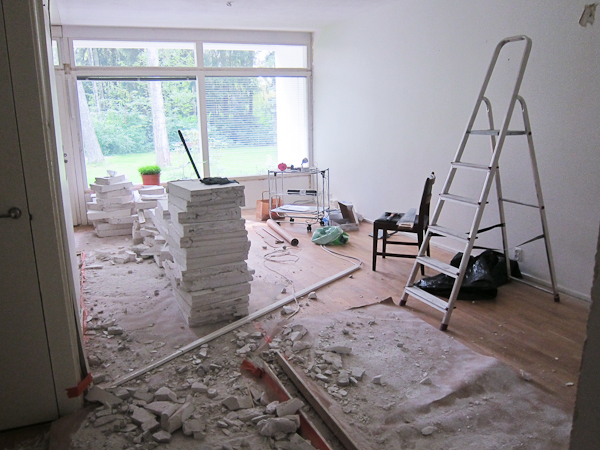 The only problem was length – my counter is 3,20 m long. Apparently you can buy countertop materials in 62 cm for up to 400 cm long sheets, but the 80 cm deep sheets tend to extend to maximum 300 cm. Since there was going to be a seam anyway (there was no way I was gonna shell out the cash for a MTM Corian counter! ), I figured I could try something out. Plywood is relatively cheap and looks awesome, and it has held up nice with the Osmo wax in the table I made a couple of years ago. 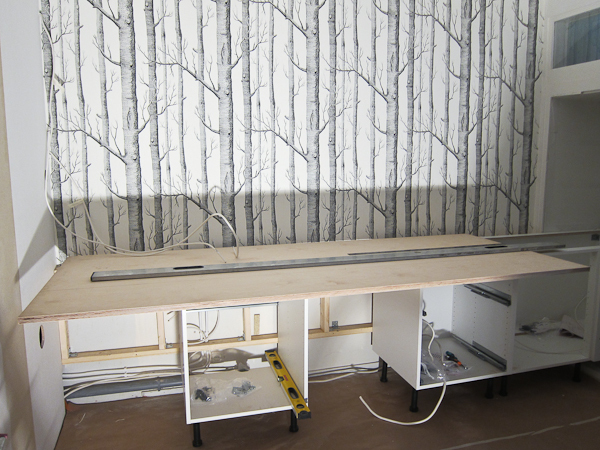 So I got a couple of sheets of the thickest birch plywood and we cut them to form on site. Plywood can be tricky to saw, mmkay. Any sawblade needs to be very sharp, and at least for circular saws there’s special plywood blades with a lot of small teeth. If you use an electrical jigsaw, like we did on the cutouts for the sink and the stove top, don’t use any forward motion in the blade. That will splinter the plywood. 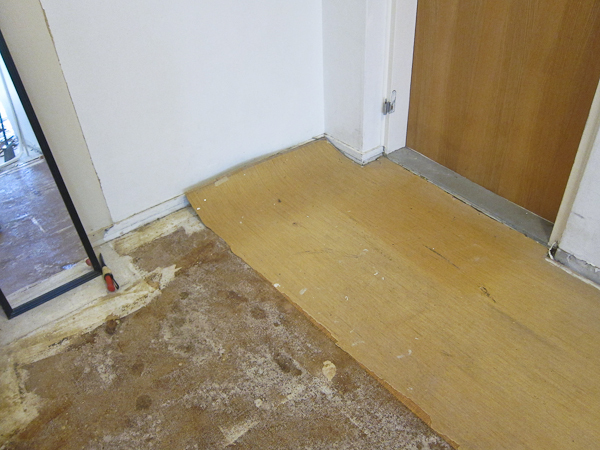 Some people recommend putting tape to the intended saw line and sawing through that, which might have helped. I only saw this tip after we had already finished the counter… 🙂 Anyway, no forward motion on the blade with very slow and careful forward motion with the saw did the trick for us. 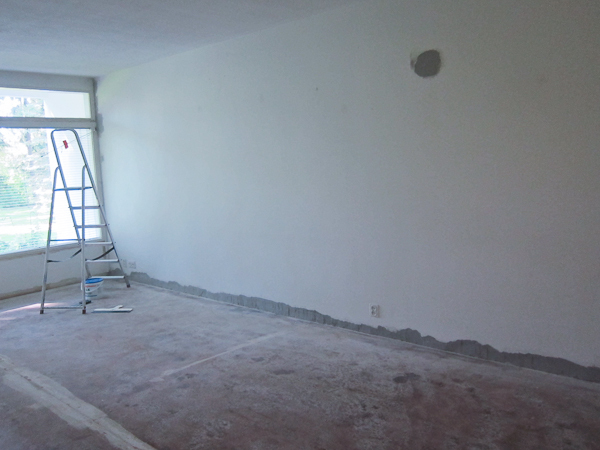 Starting to take shape… the empty spot in the middle is for the dishwasher. Sanding the countertop would have been easier on top of another table, but we had already attached this in order to measure and cut out holes for the sink and stove top. The sides of the holes, especially for the stove top, were thin and we were scared to break the counter top if we moved it. 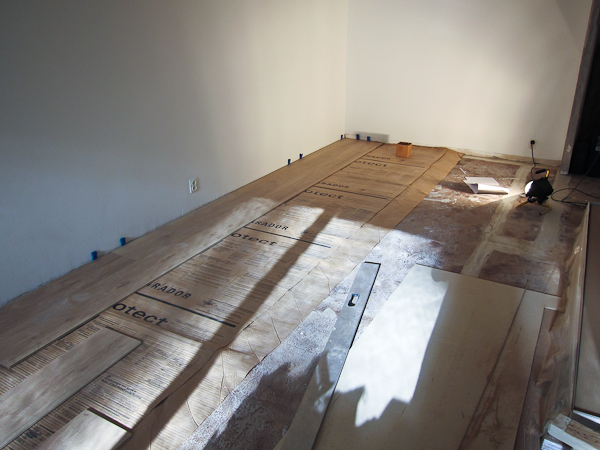 The cut outs are lined with a marine silicone/glue to keep any water out of the plywood. After attaching the sink (more silicone/glue and the snippets that are screwed in), I waxed the counter with Osmo products just like I did with the table. I’ve been using the kitchen for about 7 months now, and it seems I need to put another coat of the wax on… but this was to be expected. My friend has waxed their counter with the same products and she told me they needed to rewax a couple of times the first year and yearly after that. And here it is in all it’s glory! 🙂 The top cabinets are lined with plywood, I think that gives the outside a nice finish. I was a bit worried about placing the oven next to the fridge, but I’ve been cooking a lot and following how it behaves, and there seems to be very little escape heat on the sides of the oven. 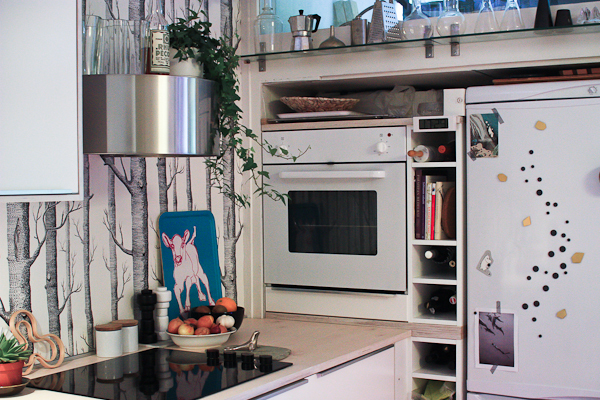 There’s plenty air space behind the oven and some between it and the fridge too. I finished the back edge of the countertop with some more silicone/glue and a U-shaped aluminium profile. 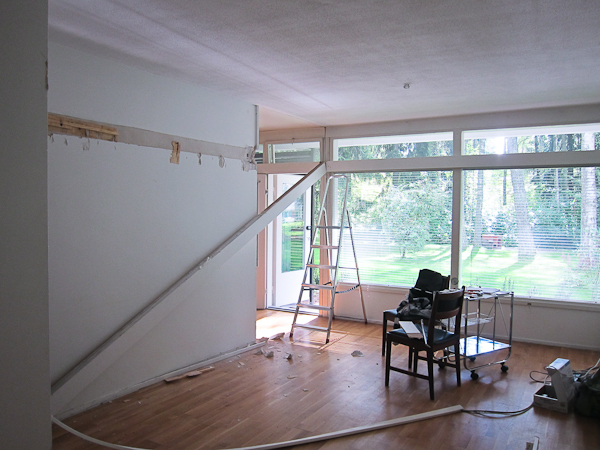 My first idea was to put glass next to the wall to protect the wallpaper, but I didn’t like the look of it. 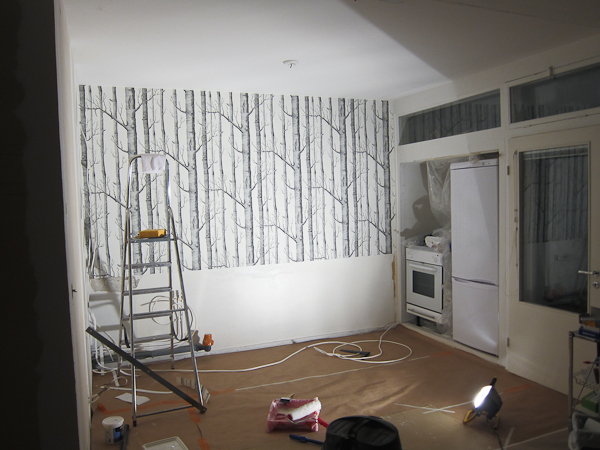 So I painted the wallpaper with a couple of coats of clear laqcuer. I figured I’ll see how long it lasts… So far it’s held up nice! I just wipe any spills with a damp cloth and they haven’t left stains. The oven, stove top , fridge, microwave (in the left cupboard) and faucet are from the old kitchen, so I only had to buy the dishwasher, extractor hood and sink. I dreamt of a new faucet, but the nice ones tend to cost a pretty penny. My plumber warned me against Ikea faucets, he had heard of a lot of leaks with them. In the end I figured I could update the faucet later. The washing machine I had bought for my old place, so that didn’t add to the costs either. It needs so much extra space behind it that I can’t get a door to cover it, because the plumbing eats away what extra I had behind there. I’ve been thinking of a curtain to cover it up, but it doesn’t really bother me as it is, either, so that hasn’t been a high priority. 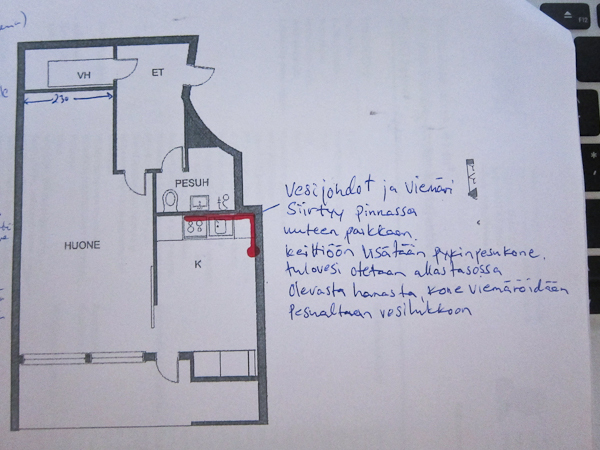 The red line marks where the plumbing and pipes run, and unfortunately a lot of that would have been visible in the new kitchen. 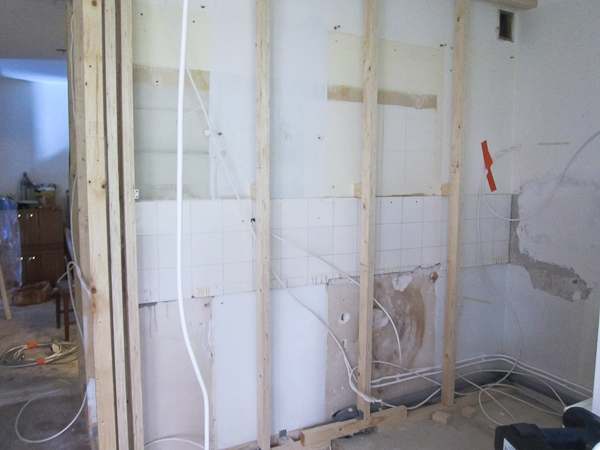 So we built the wall out to house the plumbing, pipes and electricity. Also, there were 2 holes near the ceiling. 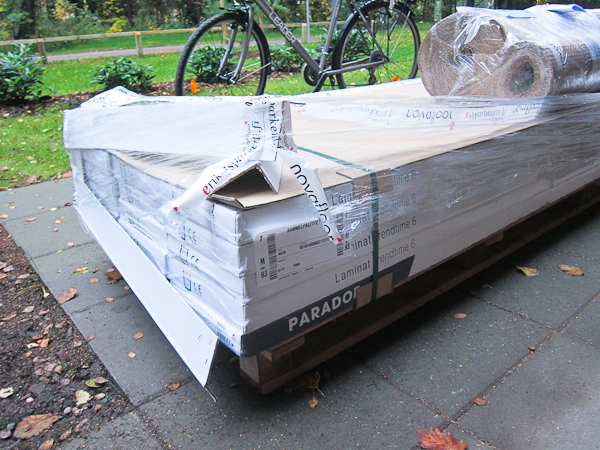 These are for the air to get around the building and could not be covered. So we put in extension pipes for them. 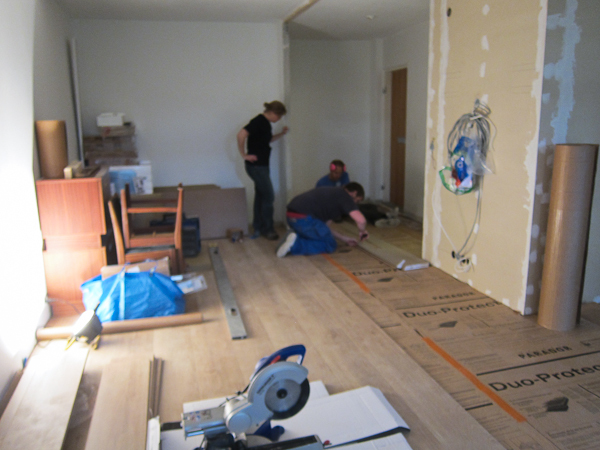 I was super afraid to drill into the floor because of the underfloor heating. I had no idea where the pipes lay in the floor, although they probably didn’t run them right next to the bathroom wall under the kitchen cabinets in -58. Nevertheless, I didn’t want to risk puncturing one of them. 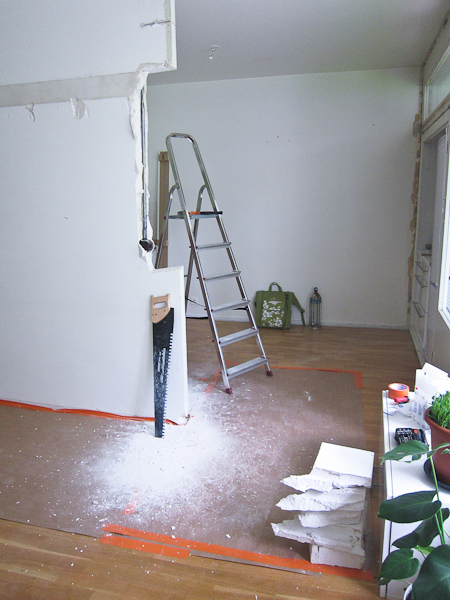 So we attached the vertical studs on a horizontal stud that’s attached to the original wall behind it. It took some fiddling to get the wall extension as thin as possible, so here we’re building a bridge over the original sewer that was much wider than the modern plastic plumbing. I had the plumber and electrician come in and finish everything they needed to do behind the wall, and then we finished the studs and attached the drywall. 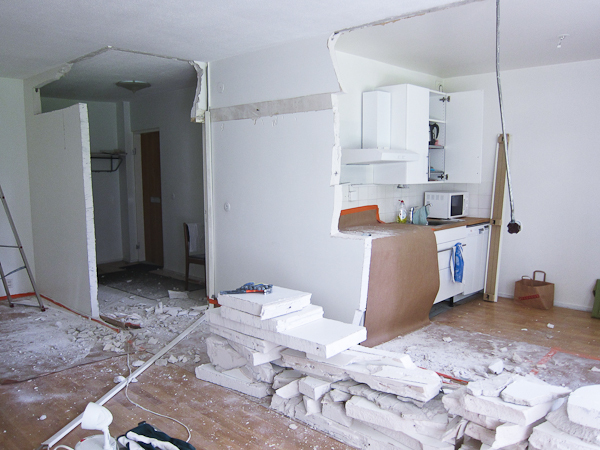 You can see the drywall up in the post about the floor. 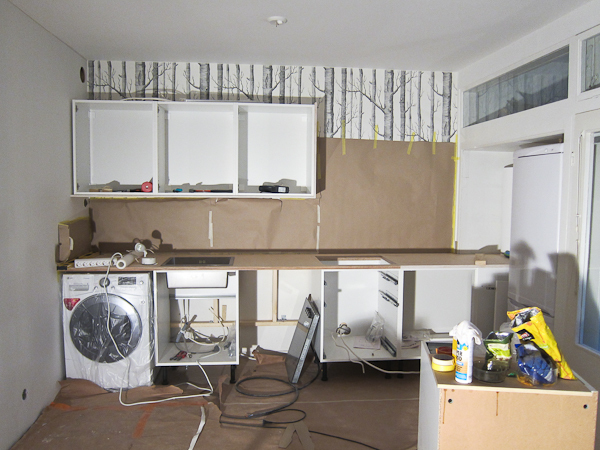 After the wall was finished and floor extended all the way, we smoothed the new kitchen wall and put up the wallpaper. 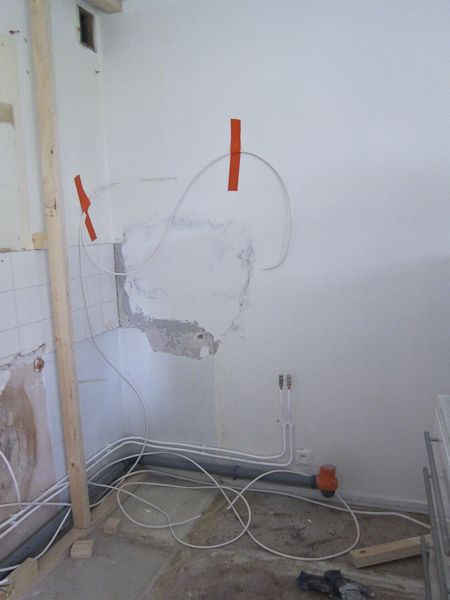 The plumbing and electrical cables are still just sticking out of the wall, since further progress with them needed the kitchen to be assembled first. That recess the fridge and oven are sitting in is actually sticking out from the building wall. It used to be one of those pantries or cold storage cabinets they had in the 50’s. It basically had insulated doors and a couple of holes in the back wall, to let in the cold air from the outside. 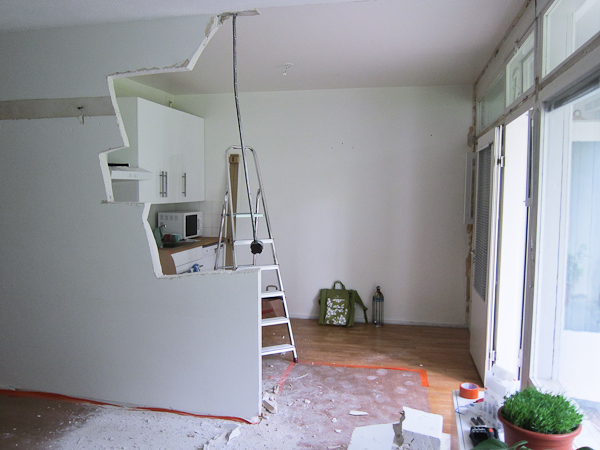 Now the doors are gone, the holes covered and insulated and it’s just a weirdly shaped nook in the kitchen… but more of that later! 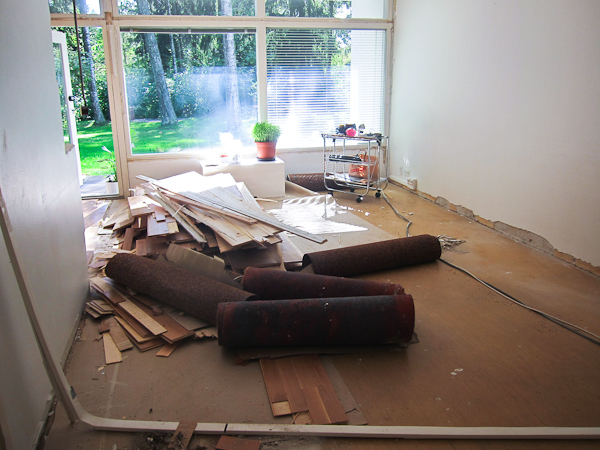 With the floor gutted to the concrete and (most of the) painting done, it was time to start laying new floor! 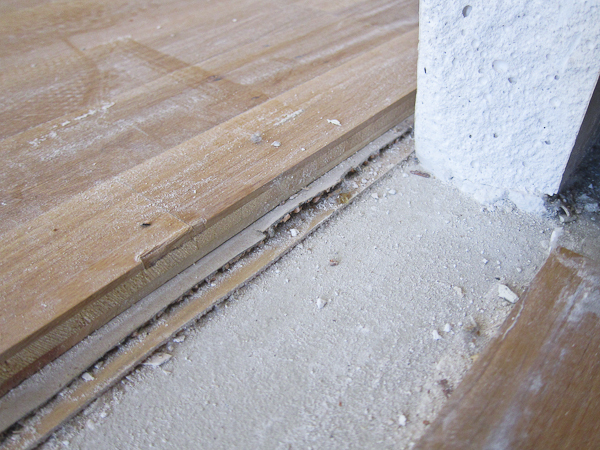 Originally I thought I’d replace the old and worn parquet with a nicer parquet, but it turns out laminate performs better than parquet with underfloor heating (being thinner), and that was a big thing on the building rules. Laminate is also considerably cheaper. I wanted a certain look, and after narrowing it down to a few choices on both types, the laminate options cost about half of the cost for comparable parquet. 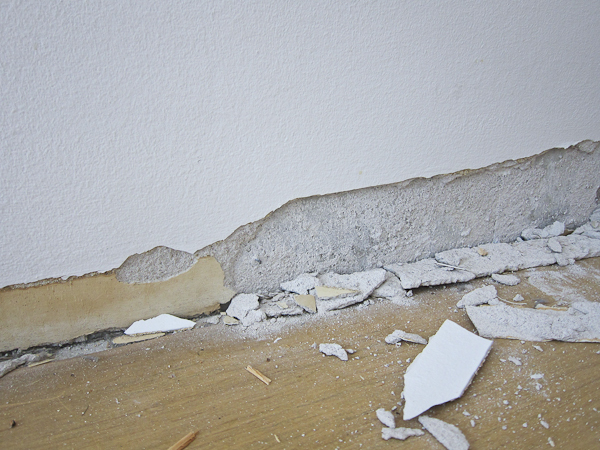 That adds up fast, when you factor in the whole floor surface! 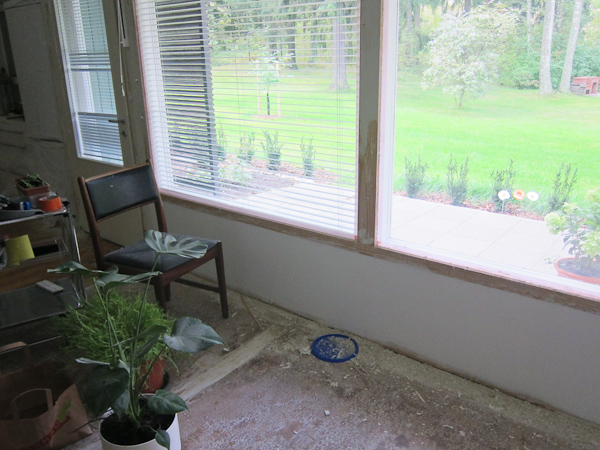 I ended up scraping the window frames. That was a ton of work, but there were so many layers of old paint that just painting over was not going to look good. I tried to sand them at first, but there was simply too much to sand. So I got out a heat gun. That looks and works like a blow dryer, but produces much more heat. So much that you can burn stuff, if you’re not careful – I curled the hair on my arm a time or two, but luckily didn’t get real burns. Warm up the paint just enough for it to soften and then scrape off the warmed piece, repeating the steps until most of the paint is gone. The place didn’t look bad to begin with, not at first glance anyway. It had seen better days, but it was in totally livable condition. Very much like my previous rentals! 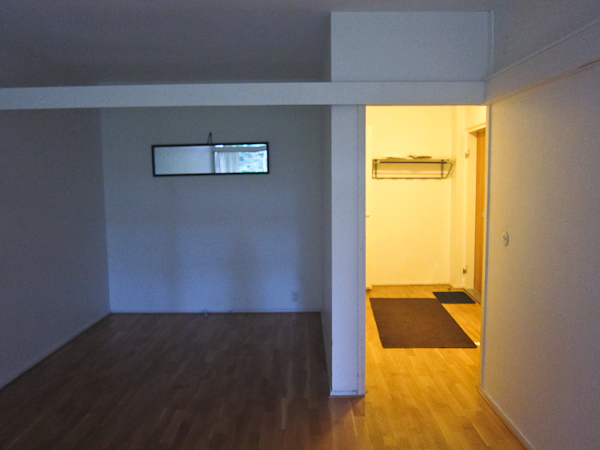 The apartment is 41 sqm, but the walls and especially the beams separating the living room from the alcove and kitchen made it feel smaller. 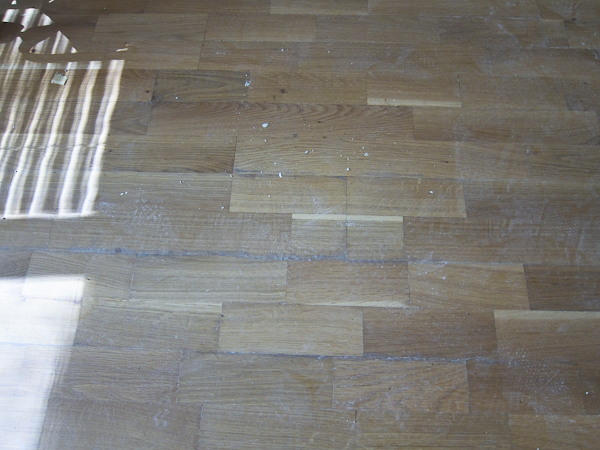 The parquet was probably made from spare ends, as a lot of the pieces were just a couple cm long… and it was very, very worn. 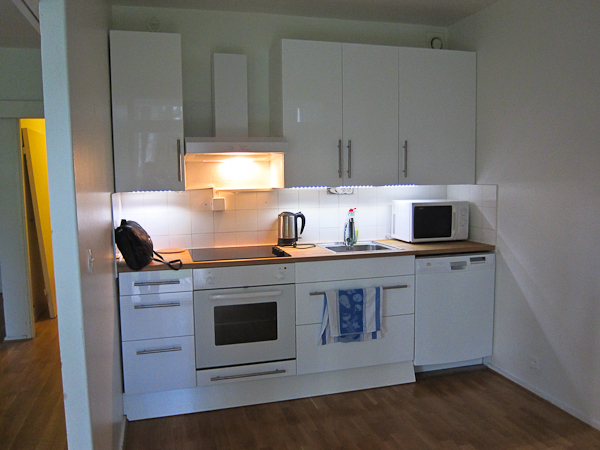 The kitchen wasn’t that bad, having been updated in 2008. 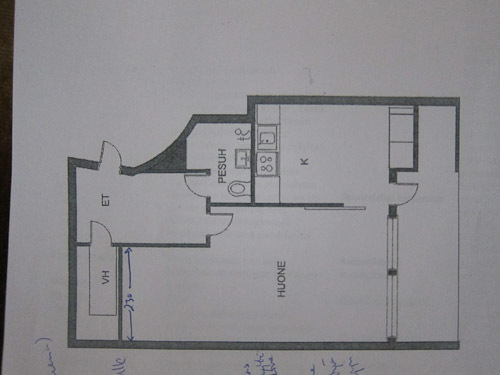 There was space for a small dining table, but it also felt very cramped, and I hated that if I put my table there, I would need to go around it to reach the fridge… the layout just wasn’t working out for me.